Successfully Added USB-C Travel Dock - VGA, HDMI, Micro SD, SD, Compact Flash, 3.5mm Audio, USB 3.0, USB-C, Supports All Major Brands to your Shopping Cart. 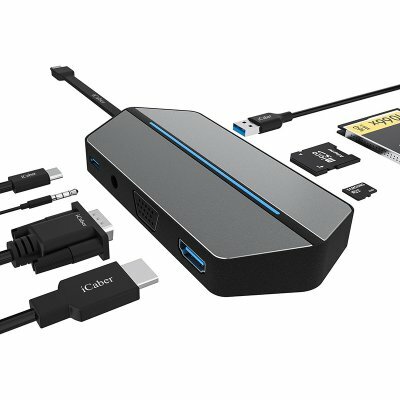 This compact USB-C travel dock has been designed to match all your connectivity demands. With its 8-in-1 design, it comes packed with an abundance of useful ports and inputs. It comes with a VGA, HDMI, Micro SD, SD, Compact Flash, 3.5mm Audio, USB 3.0, and USB-C port. Thanks to this, your USB-C adapter lets you attach your tablet, smartphone, or laptop to any larger display and other electronics. The gadget features an extremely compact and lightweight design. This allows you to easily carry it around anywhere you go – making it the perfect travel gizmo. By supporting Windows, Android, MAC, and Chrome operating systems, this USB-C hub can be used with nearly all electronics out there. It supports high-speed data transfer that lets you enjoy your media on an external display without experiencing any lag. Both its HDMI and VGA ports can be used at the same time. This brings along great split-screen possibilities. Full-HD 1080p resolution is supported so you will be able to transmit the latest movies stored on your mobile device straight onto your big screen TV monitor. Additionally, you can browse the web on your phone and stream media while watching it on your television. This virtually turns your regular TV into a full-blown smart TV. If you are looking for a compact gadget that provides you with ultimate connectivity, this 8-in-1 USB C hub is perfect for you. This USB-C Port comes with a 12 months warranty, brought to you by the leader in electronic devices as well as wholesale travel gadgets..
Arabic: - لوحة الوصل USB-ج - Chinese Simplified: - C USB 集线器 - Czech: - USB-C rozbočovač - Danish: - USB-C Hub - Dutch: - USB-C Hub - French: - Hub USB-C - German: - USB-C-Hub - Hebrew: - רכזת USB-C - Hindi: - USB-C हब - Italian: - Hub USB-C - Japanese: - USB C ハブ - Korean: - USB-C 허브 - Malay: - Hab USB-C - Norwegian Bokmål: - USB-C Hub - Romanian: - Hub USB-C - Russian: - Концентратор USB-C - Spanish: - Hub USB-C - Thai: - ฮับ USB-C - Turkish: - USB-C Hub - Vietnamese: - Hub USB-C.